The last few summers, being extremely dry with water restrictions in place, we here at DFW Improved are seeing more foundation issues than ever before. Foundations and soaker hoses are like a hand in a glove. In many cases it can be a simple, but effective solution for the ever-prevalent problem of too little rain in much of Texas, and especially in the North Texas areas. Dry Texas Soils and Home Foundations – What Could be Worse? Foundation issues show up in a few different ways. Cracks in the slab itself, cracks in brick walls and siding, cracks in sheet rock, doors sticking/not closing, cracks in tile floors, wood floors lifting and/or trim separating are some of the signs your home’s foundation settling. Foundation Fixes – Soaker Hoses? 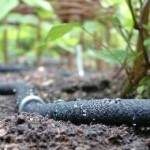 Soaker Hoses are a good method of keeping the soil around your home moist. They can be laid on top of the ground and held in place with wire staples or laid in a trench 2 – 3 inches deep and covered. I prefer to bury my hoses. This reduces evaporation, the chances of damage to them by shovels and rakes and it reduces the possibility of damage due to freezing. When placing soaker hoses around your home they need to be approximately 12 inches out from the slab. If you install soaker hoses against the slab, it can cause the soil supporting the beam to become saturated and lose its strength…also causing the slab to settle, same symptom, different cause. Soaker hoses can be purchased at most hardware and home improvement stores. I also recommend getting a timer that will screw on to the spigot. This allows you to set the time of day, I prefer evening to also help reduce evaporation, and the length of watering time depends on the moisture in the ground. Be aware that the moisture content can vary during wet or dry periods during the year and you may need to make adjustments. These adjustments may end up being 4 to 6 times a year, or it could be that you only need to adjust it twice a year. It all depends on your home’s foundation and changes to the soil conditions around it. The weather, the number and the size of your trees and the maturity of your shrubs will all play a part in how often and how long you will need to run your soaker hoses. This time of year I run my hose about an hour each day and it appears to be keeping the soil moist without being muddy. If the winter is wet or gets extremely cold, then I will adjust the time accordingly. Use a screwdriver as a quick test to see if you need more or less water. Stick the screwdriver into the soil. Water more if it comes up dry. Water less if it comes up caked in mud. It doesn’t need to be real scientific, but the key to protecting your foundation is to keep the moisture levels in a consistent range. You can also purchase a regulator to reduce the water pressure in the hose or just turn the spigot on about a ¼ turn. This does work and might save you thousand of dollars in foundation repair costs and then additional remodeling costs in your home to repair cracks in the drywall and wood trim materials. Money that you could use to remodel and update important areas of your home for your family’s use and enjoyment. Have Home Improvements that Need Our Help? Call us today at 972-377-7600 to schedule an appointment, and get a free estimate for your next home improvement project. Our seasoned remodeling pros have the experience to deal with the most complex home improvement projects.Whether it’s kitchen remodeling, bathroom remodeling, room additions, home repairs, interior or exterior painting, outdoor living or an insurance restoration project, DFW Improved is the right contractor for any of your needs. Let us know how we can help you! Visit our Photo Gallery to get inspired by home remodeling ideas and pictures of our most recent projects, and connect with us on Pinterest, Facebook, or YouTube.